Over twenty FHL resident scientists conduct research at FHL year round and approximately a hundred visiting researchers come to FHL each year likewise. In addition to the important science that happens here, an equally important reason why people come to FHL year after year is the camaraderie that is fostered amongst fellow faculty, students and researchers. A recent list of researchers at FHL can be found here. Past researchers from 2015 to 2004 can be found here. A partial list of publications from these researchers, many directly related to their research at FHL can be found here. As of Autumn, 2016 this is a list of current FHL research projects that are funded. Carrington, Emily, PI, Washington Sea Grant. Mussel attachment in a high CO2 world: an integrated ecomaterials approach. 2014–2018. Cordell, Je , PI; Co-PIs: Megan Dethier, Emily Howe, and Jason Toft, Washington Sea Grant. shoreline Armoring removal: synthesis and Assessment of restoration E ectiveness in puget sound. 2016–2018. Dethier, Megan, PI, Department of Natural Resources. Long-term monitoring and focus studies in shoreline biota in puget sound. 2013–2017. Dethier, Megan, PI; CoPIs: Je Cordell, Jason Toft, Snohomish County. Estuary and salmon restoration program. railroad grade beach nourishment planning. 2015-2017. Dethier, Megan, subcontract Estuary and Salmon Restoration Program; PI: South Puget Sound Salmon Enhancement Group. E ects of bulkhead removal on beaches and their biota. 2016-2018. Dethier, Megan, PI; Co-PI: Jennifer Ruesink, Washington Sea Grant. relative strengths of factors causing post-settlement mortality in juvenile clams in diverse WA waters. 2016–2018. Foe, Victoria, PI, Seaver Institute. Colliding Polymerases. Does replication fork collision with pol 2 activate downstream gene expression? 2011–2018. Hodin, Jason, PI, Stanford University. Turbulence-spurred settlement: Deciphering a newly recognized class of larval response. 2015-2017. Klinger, Terrie, PI; Co-PIs: Thomas Leschine, James W. Murray, Kenneth Sebens, NSF. IgErT Award: Integrative graduate Training in Ocean Change. 2011–2016. Murray, James W., PI, Educational Foundation of America. Ocean Acidi cation Mesocosm Experiments. 2011–2016. Sebens, Kenneth, PI; Co-PIs: Alex Gagnon, Danny Grunbaum, Jan Newton, Billie Swalla, NSF. Ocean Observatory system at FHL that will monitor local ocean change and provide real-time data to scientists. 2014–2017. Summers, Adam, PI; Co-PI: Megan Dethier, NSF. 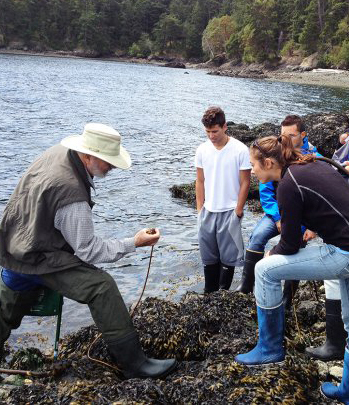 research Experiences for Undergraduates: Integrative Biology and Ecology of Marine Organisms. 2010–2017. Summers, Adam, PI, UW CoMotion. Developing and testing prototypes of suction cups based on cling sh physiology. 2016-2017. Summers, Adam, PI; Co-PI: Petra Ditsche, UW Royalty Research Fund, RRF. Bioprospecting for attachment mechanisms in a fouled environment. 2015–2016. Summers, Adam, PI: NSF. Collaborative research: An integrative approach to the performance and evolution of high performance suctorial disks in shes. 2012–2017. Swalla, Billie, PI, NSF. BEACON “Bio/Computational Evolution in Action CONsortium.” Fosters interactions between computer scientists, engineers, and evolutionary biologists to solve contemporary problems. 2011–2021. Swalla, Billie, PI, Seeley Fund. Ocean research on Tetiaroa. 2015-2017. Truman, Jim, PI; Co-PI: Lynn Riddiford, Howard Hughes Medical Institute. Crustacean Neurobiology. 2016-2021.